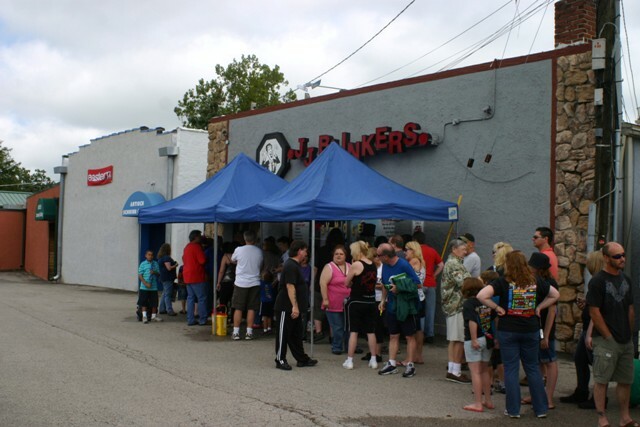 SVENGOOLIE at JJ BLINKERS: Horror Host fans arrive in droves! 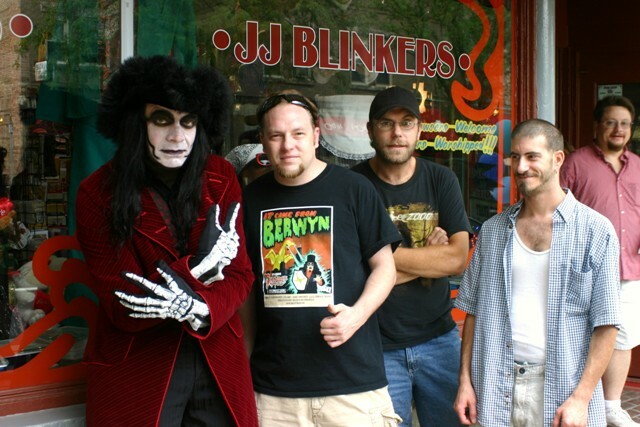 The Internet had been buzzing for weeks at the news of National horror host, Svengoolie, making a public appearance at JJ Blinkers – a costume/trick shop located in Antioch, Illinois. The “Rubber Chicken, Whoopee cushion kinda store” was an obvious perfect fit for Sven, while its location (north of Chicago) made it an ideal spot for his Wisconsin fans to see him as well. I had heard of this event almost from the moment it was booked courtesy of my friend, Dr. Destruction. Dr. Destruction is an avid fan of both Svengoolies and was honored by the Chicago icon when he participated in his Kenosha based “Big Top Radio Show” (for which I was also honored to be a part of) a few weeks back. Unable to contain his excitement of seeing Svengoolie again, and at one of his favorite stores, Destruction began his own one-man media campaign. Banner created by Dr. Destruction for Sven’s signing area! Destruction painted a banner specifically for the event while tirelessly sending out flyers, plugging the appearance via his radio show, not to mention posting it all over Facebook. 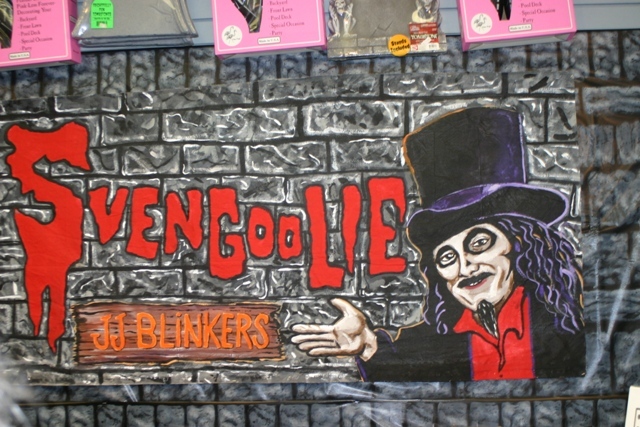 JJ Blinkers also did a tremendous job, not only in advertising, but by also enhancing the occasion with fun gifts and embellishments perfect for enticing Svengoolie fans! 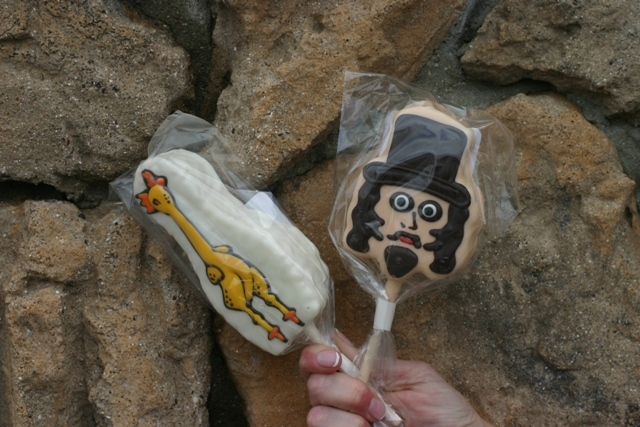 My favorite was the “Svengoolie Rice Krispy Treats” created by a nearby bakery and gift bags for children that included tiny rubber chickens, a rubber chicken necklace, and a Svengioolie-style mustache. Svengoolie, however, has been having no problems commanding crowds on his own and, from my perspective, they appear to be growing. “Snap, Krackle, Pop! Rice Goolies! I left early for the event in lieu of the distance (an hour and 47 minutes per Mapquest) and the torrential thunderstorm that engulfed the Chicagoland area that morning. As soon as I entered Antioch city limits, the storm broke releasing glorious sunshine on what appeared to be a beautiful town. I arrived a full hour early and noticed a line had already formed. Dr Destruction and his crew from The Crimson Theatre arrived soon after in full costume. Dr. Destruction pulled me from my place in line (which was fairly close) and had me wait out in front of the store for Sven’s arrival. 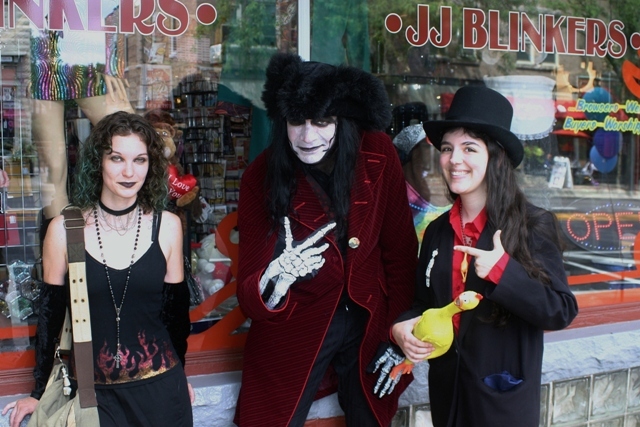 Per a prearrangement made with the store, they’d be able to quickly snap photos with Svengoolie before he’d begin meeting his fans. Sven arrived and the prized shots were taken before we hastily left. 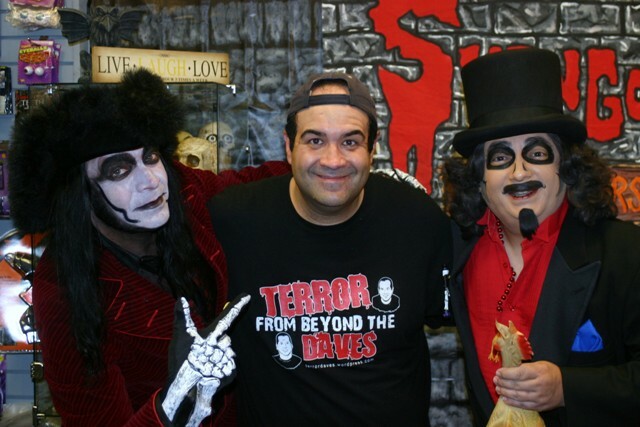 With Dr. Destruction and Svengoolie! 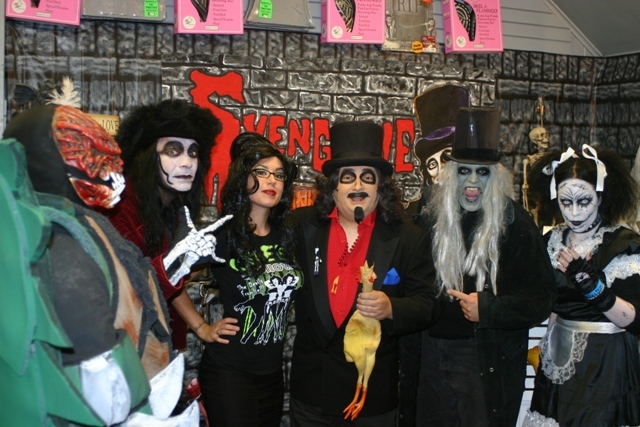 My children were nearby and always love seeing Svengoolie in person. They have grown up with Rich Koz’s Svengoolie just as I had, making him not only a source of nostalgia in our household but tradition. Although we brought things for him to sign, I explained to the kids that they have had the privilege of meeting Svengoolie many times before and that there were a lot of people waiting who hadn’t. They totally understood and just enjoyed seeing him in person as opposed to his usual place on our television screen. After snapping the photos and shaking hands with Sven, we exited the building. When I walked behind the store, I almost dropped my camera. The small line I had left an hour earlier, now went down the block and with no end in sight! 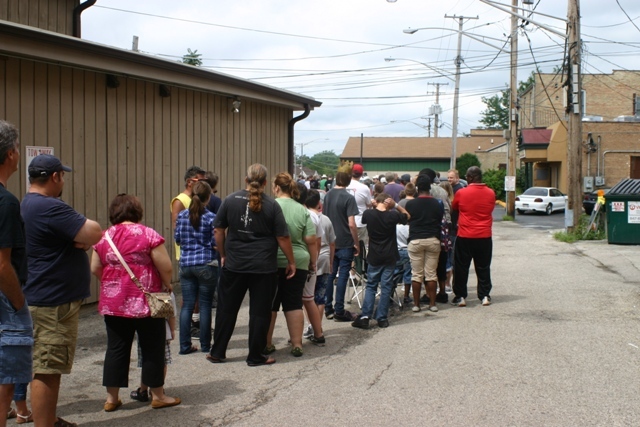 Back of the line at 2pm – No sign of the store! As I walked and surveyed the line I ran into some great friends of this site! First was Shaun Kangas and the gang from Crappy Action Dude Comics! Poor Shaun was located pretty far down the line and said he made the mistake of arriving “on time.” He was able to finally meet Dr. Destruction and, in regards to politics, the two have much in common. Destruction had a friend who arrived too late and the hope was that he’d be able to get her in for a quick shot with Svengoolie along with Shaun. After being told to wait about 30 minutes in the front of the store, it was made clear that the immense crowd would make this all but impossible. 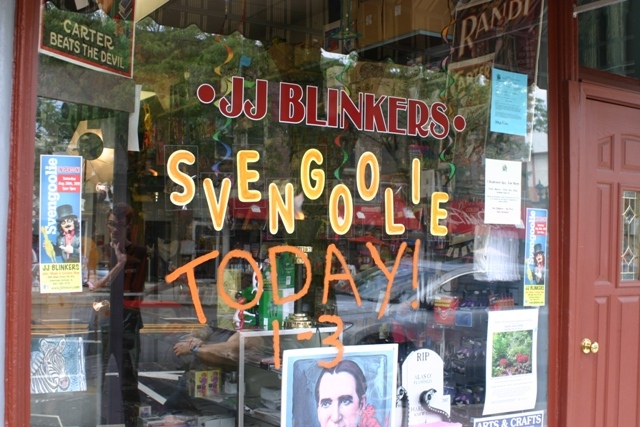 Svengoolie’s appearance was slated from 1-3pm. He would end up staying an additional three hours to accommodate as many fans a possible. Dr. Destruction and the talented gang from Crappy Action Dude Comics! Another friend, as well as guest blogger on this site, was Jamie Lee Cortese! Jamie is always a pleasure to see along with her wonderful family. Her mother purchased some of the aforementioned treats and we had a chance to talk for the first time since we’d met at Horrorhound. A huge fan of Svengoolie as well as all horror hosts, Jamie seemed pleased to also see Dr. Destruction again. We talked about Svengoolie, her experience at Flashback Weekend, and recently released movies. At this time, I don’t know whether Jamie was ever able to see Svengoolie at this event but I am sure happy she showed up regardless! Emily Gothmother, Dr. Destruction, and Jamie Lee Cortese! One thing is certain; Svengoolie’s popularity has not merely sustained itself in his years of hosting, it has exploded! 2011 has been a stellar year for the host I grew up with, and it gives me a tremendous sense of pride. It has seen him reach a National commercial audience while commanding a crowd worthy of any A-list celebrity. I hope that some of the fans that were unable to meet him at JJ Blinkers will have a chance to do so during one of his numerous, upcoming Fall appearances. But, please, take my advice……ARRIVE EARLY!!!! This entry was posted in Horror Hosts, Stalking Svengoolie! and tagged Amy Grindhouse, Antioch Illinois, Deadgar Winters, Dr. Destruction, JJ BLINKERS, Rice Krispy Treats, Svengoolie, The Crimson Theatre. Bookmark the permalink. ← Who, Me? Part 7: Emerging From Their Chicagoland Crypt, It’s Count And Countess Gregula! Thanks for the kind report, Dave. Needless to say, anytime we do one of these appearances and the turn-out is so spectacular, I’m always grateful to all the wonderful devoted fans who are nice enough to stand in line fro any length of time to visit with me. I am not always able to stay around overtime, but always hate to disappoint anyone who made the effort to come see me. This kind of support is what keeps me going. Thanks definitely should also go to the staff and ownership of J.J. Blinkers- who also hold their customers and our fans in high esteem.